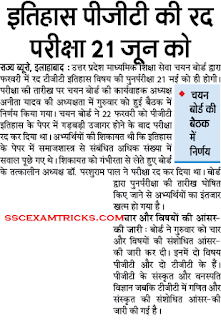 Uttar Pradesh Staff Selection Board has released new date of PGT History Examination which is going to be conducted on 17th May 2015 21st June 2015. The Admit Cards will be released on 12-15 days before the date of examination on official website. Latest UPSESSB TGT PGT Result News: The result of UPSESSB TGT PGT has got declared on official website. Candidates can get latest result news of the UPSESSB PGT TGT Result from direct link given here. 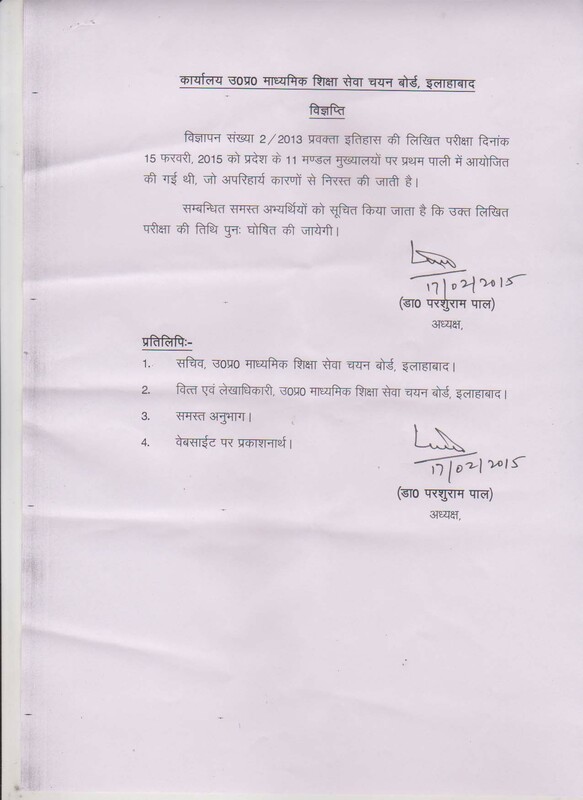 UPSESSB had released PGT History Exam cancellation notice on 17th February 2015 on the official website. 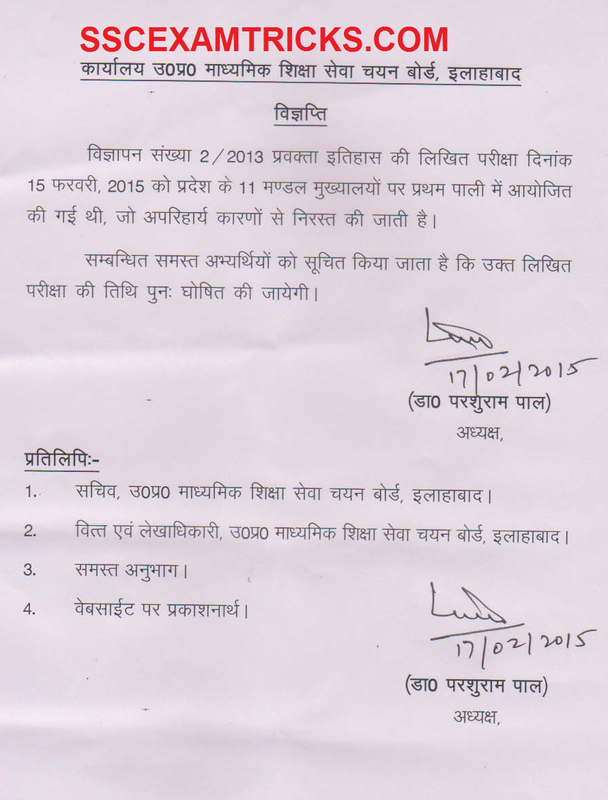 UPSESSB had cancelled PGT History examination which was conducted on 15th February 2015 on 11 various centres i.e. Agra, Jhasi, Gorakhpur, Bareilly, Meerut, Varanashi, Lukhnow, Kanpur, Faizabad and Allahabad etc. for a total of 7135 vacant posts of Post Graduate Teachers (PGT). The PGT History exam is cancelled due to unavoidable reasons. 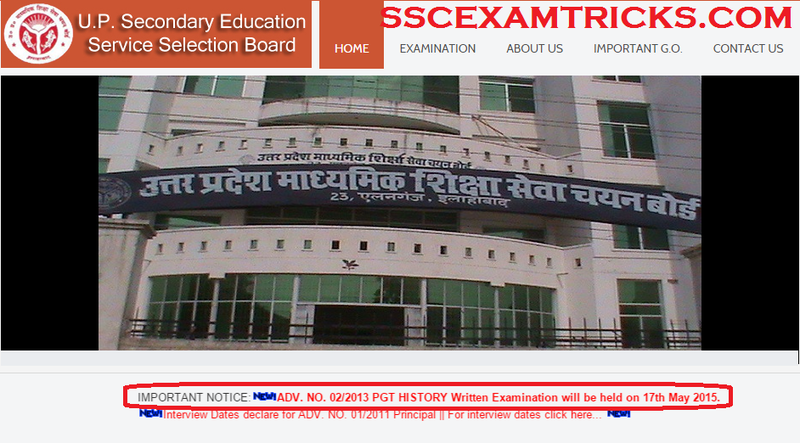 The new date of PGT History has announced on the official website of UPSESSB. Approx. 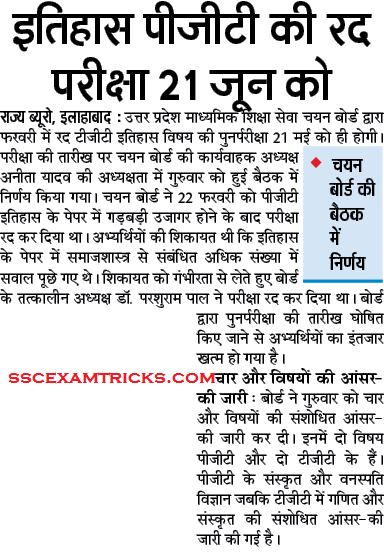 2145 candidates are going to appear in this revised UPSESSB History Exam 2015. Earlier UPSSB had released notification for the recruitment of a total of 7135 TGT & PGT in all over the government schools of Uttar Pradesh. Those candidates who had appeared in PGT History Exam are required to attend revised PGT History examination which will be conducted on 17th May 2015 21st June 2015. The latest news is that UPSESSB is going to release online admit cards which is expected to be released one week prior to the date of examination on official website. Candidates can download the notification of PGT History Exam Cancellation from the direct link provided in the end of the posts. These candidates are required to wait for new dates of PGT History Re-exam which will be announced on official website.